Tim has caught countless thirty pound carp and over 25 UK forties plus a UK fifty, most 10 years or many more years ago, as he put his focus into his original research, new bait testing, his dynamically-adaptive creative personalised bait tuitions, writing and original research; following hooking the world record carp (he had put his ever-evolving insights and developments into practice hooking a previous world record carp in 2006.) Historically he caught the 2 biggest catfish in the UK, each on more than one occasion and at the time caught more catfish over 70 pounds and 100 pounds using homemade baits than any UK angler; this literally catapulted his learning curve in carp bait effectiveness and more potent designs and applications compared to conventional food bait thinking he’d used for 25 plus years in his homemade bait designs previously. See the contents of the new Ultimate Tim Richardson Carp Bait Making Secrets Course Ebook Now! He posted his catches on homemade baits for a brief period in angling media and was nominated for a national award in the Angler’s Mail along with anglers such as Nigel Sharpe and won many monthly competitions. However such attention is not something Tim is at all interested in; the real challenge is self-development, cutting through limitations in thinking and bait effectiveness and helping other anglers become massively more empowered to create far more potently successful baits and most especially ones that require lowest volumes and least time to achieve maximum big fish success fastest. Yet it is his ebook readers and 1-1 tuition clients catches which have been most significantly improved by his work and provide the credibility of his work, quite apart from his own personal catches. His focus is most upon how to stimulate optimum feeding responses, creating precisely the exact kinds of bait palatability for the most powerfully instant and most intensely prolonged feeding responses, far beyond ‘normal’ baits fish are exposed to over 90 percent of the time, as well as work the entire water column to increase bait impacts and alter fish behaviours as powerfully as possible. Tim has had much experience testing baits and substances creatively, for many bait companies, from Rod Hutchinson in the eighties and more recently as a consultant for CC Moore for several years. Numerous of his ebook readers have used his ebooks as a base and inspiration for starting successful new bait companies. However Tim’s mission is to help anglers achieve far improved results by creating their very own uniquely-potent and genuinely-optimised homemade baits. This includes guiding them very specifically in what truly works against the leading readymade baits and also in harnessing the power of their own creative processes and thinking outside the conventional redymade bit maker’s thinking to produce the bait uniqueness, incredible satisfaction and increased success all this is so well proven to bring! 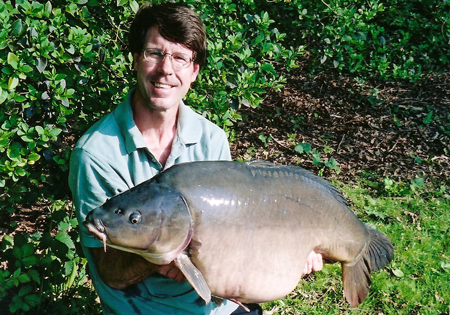 In the past Tim has caught several of the biggest fish in lakes on homemade bits and has won competitions for his multiple-forties captures, back in 2005 at a time when these were not commonplace. He hooked the world record carp in 2006, by this time he had also hooked the biggest catfish in the UK at the time as well as catching more catfish over 70 pounds using homemade baits than anyone else previously, as well as hooking 2 of the biggest leather carp in the UK and a UK fifty on his homemade baits. He learned more from intensive study and testing of his dynamically-evolving no-egg extreme-potency baits designed for big catfish than from fishing 25 years using conventional high nutrition and balanced nutrition boilies and pastes, though recognition of this is really only being manifested today as more and more anglers use not-heated and no-egg baits pastes and boilies and seek Tim’s newest generation of big carp and catfish bait secrets. In 2005 Tim released his self-published biographical ebook “Big carp bait secrets” which was an introduction to conventional boilie design using very standard instant bait and food bait thinking. The next ebook went beyond that stage as Tim’s big catfish experiences of the biggest UK catfish and many others over (0ver thirty over 60 – 70 plus pounds,) plus captures of a UK fifty, and possibly the biggest UK leather at the time, and numerous multiple-forty pound carp captures on his alternative bait thinking and designs, much based upon his big catfish bait designs came to attention through the media at the time. Following this ebook Tim was invited to join the British Carp Study group, and went on to release his third and most intensively-research ebook “Big carp and catfish flavours components feeding triggers (bioactives addictive substances, palatability and metabolic and other stimulatory and sensory system and water-reactive bait detection optimisation factors) secrets, in around 2008/9. Following this, Tim did more and more intensive bait testing of substances, levels, synergies, live processes, fish responses in comparison to control baits, homemade paste variations and leading brand readymade baits, fortunately living within casting distance of a lake from his kitchen plus others within walking distance. This was an intensive bait testing period of additives, levels, and very exciting breakthroughs and realisations. during this period Tim occasionally did bait filming with Alan Welsh for CC Moore, as a consultant writing many associated articles relating to creative uses of additives in more innovative ways and levels and processing than in conventional readymade boilies. During this period of years of intensive reality bait testing Tim’s evolving perspectives, insights and experiences further evolved his realising that baits really can be optimised better outside of the limitations of traditional bait making methods, leaving behind eggs boiling and rolling. Tim’s evolving beliefs and realisations that baits must begin as the most efficient, most stimulating instant-acting baits possible as a mirror of internal and external fish evolution for the most unfavourable winter temperatures and de-oxygenated summer conditions, has led to his evolution of very different homemade bait and designs compared to popular conventional boiled or steamed rolled boilies. In particular, his more recently-evolved ideas and new bait manifestations have proven remarkably instantly successful for big fish, for countless anglers of every level of experience, applying baits in the lowest possible volumes, where superior bait bioactive potency and feeding trigger impacts and palatability aspects have marked them out as great homemade baits. With the past 6 years of bait tuitions plus having had input of anglers using his ebooks in over 100 countries for 11 years has given Tim a unique insight into homemade baits and the truth of what works best. For so many anglers this has come to the point of making readymade baits totally irrelevant as more and more anglers become self-empowered by utilising Tim’s tuitions, and his most recent ebook course most especially. This is totally new; hugely surpassing the previous ebooks in new testing results and not merely in new unique research and creative processes and bait applications. It is the condensation of the best of the best of the uniquely re-refined, alternative bait making systems, processes, unique bait applications and new thinking which he has evolved and proven through the resulting homemade baits and catches of anglers; from total beginners to top rods with such striking improvements, and often dramatically-instant big fish success against leading readymade baits!